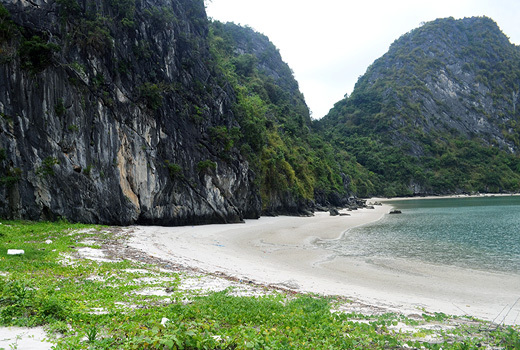 Thang Loi island is located about 40km off the short of Van Don island district. There are many small islands such as The Vang, Ria, Tung Con...These islands are separated from the center of the main island and have beautiful beaches, suitable for tourists staying the night on the island. There is also Quan cave, a beautiful site for cave explorers. Tourism potential of Thang Loi island is quite rich. This place has many beautiful sites concentrated in small islands such as The Vang, Ria and Tung Con. The islands are located away from the center of the commune and have beautiful beaches, not any less compared to other famous beaches of Minh Chau, Quan Lan, Ngoc Vung, Co To, and they are far from the everyday noisy life of the neighborhood. For Tung Con island, there is Tung Con bay about 30 ha wide, surrounded by limestone mountains, calm in the air and mild climate, people say that the temperature is lower 5c degrees than outside and is the best stopping place on hot summer days. " Thang Loi has many vestiges, pagodas, if restored, are suitable for spiritual tourism. The fishing grounds here are also suitable for the type of leisure tourism like night squid fishing. People in the commune can catch about 10kg of squid in a few hours. Thang Loi is the crossing point between Bai Tu Long Bay and Ha Long Bay, so the scenery is plentiful. Located about 7 km from Thang Loi is Ngoc Vung island so visitors can travel both islands in a trip. The sea area managed by the commune also contains Quan cave, a naval unit stationed here during the American war. This cave can accommodate many people at the same time.